Why? It seems reasonable to ask. When an author leaves behind volumes of published work, what compels our attention to their mere correspondence? We write today to share an intriguing letter by T.E. Lawrence that helps answer the question. 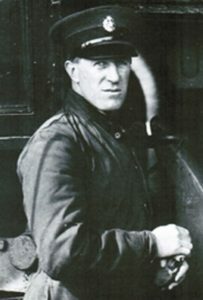 Central to the life story of T. E. Lawrence (1888-1935) is his military odyssey in Arabia during the First World War. There he found fame as instigator, organizer, hero, and tragic figure of the Arab revolt against the Ottoman Empire. 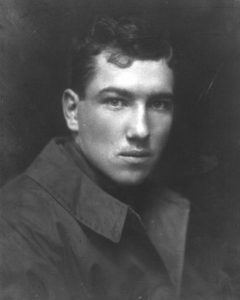 Lawrence began the First World War as an eccentric junior intelligence officer and ended as “Lawrence of Arabia.” This time defined Lawrence with indelible experience and celebrity which he would spend the rest of his famously short life struggling to reconcile and reject, to recount and repress. Personal correspondence is ephemeral, unpolished, and personal in a manner fundamentally different than published literary works. Perhaps that is precisely why the brilliant, complex, and deeply conflicted facets of Lawrence’s character often glint most tantalizingly in his personal correspondence. To the point is an original, autograph signed letter dated 2 March 1933 from T. E. Lawrence to his friend and fellow writer Henry Williamson. A mere 125 words long, the letter is nonetheless rich in both references and inferences. 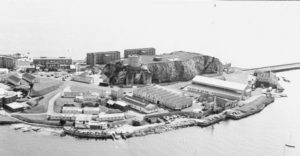 Penned at Mount Batten R.A.F. 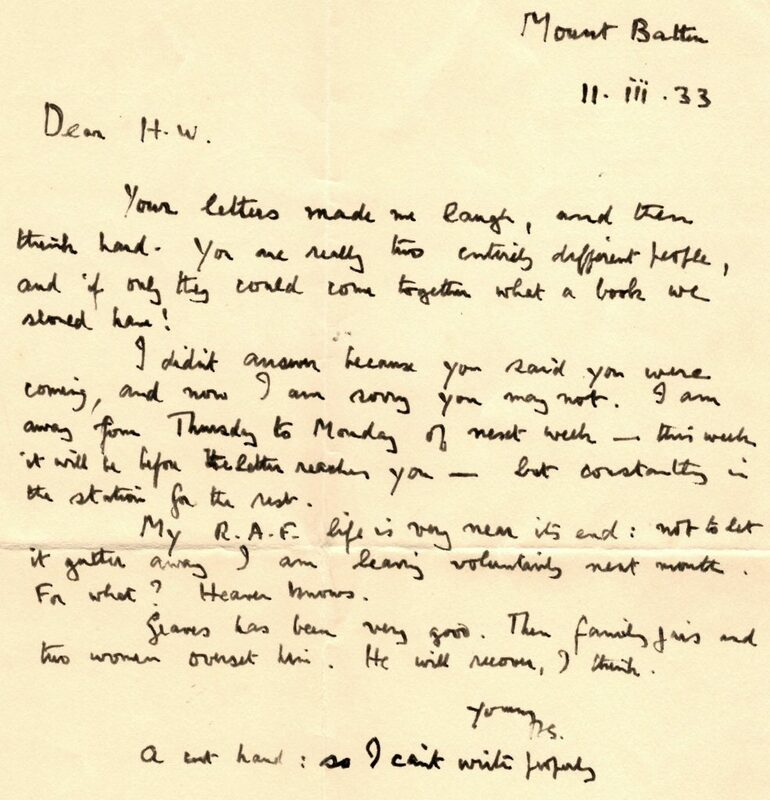 station, the letter is a window into Lawrence’s friendship with Williams, as well as his friendship with writer Robert Graves, and references Lawrence’s angst about ending his R.A.F. career. The letter also eerily presages correspondence regarding meeting with Williamson that would inadvertently precipitate Lawrence’s death a little more than two years later. 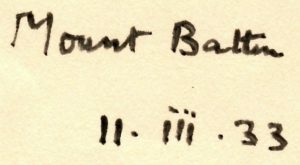 The letter is headed: “Mount Batten | II.iii.33”. 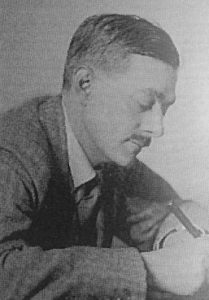 In a state of nervous exhaustion following the First World War, his work on the post-war settlement, and writing and re-writing Seven Pillars of Wisdom, in 1922, Lawrence enlisted in the ranks of the R.A.F. under the name of John Hume Ross. Lawrence’s time with the R.A.F. 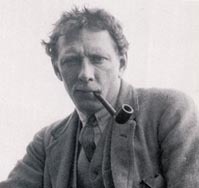 proved remarkably revealing – of his talents, both literary and technical, and of the dynamic tension in his life between his need for quiet anonymity and his fame and engagement with the famous. It is telling that The Mint, Lawrence’s unstintingly candid portrait about life in the Royal Air Force Ranks, paralleled Seven Pillars – with a tortuous writing, editing, and publishing history culminating in posthumous publication. The other of the “two women” referenced is likely Nancy Nicholson, Graves’s wife; the three had untenably cohabitated until the menage was upended and Nicholson was left to raise her and Graves’s children alone. Equally of note, in 1934 Lawrence was similarly put off by Williamson’s emotional disclosure about romantic entanglements. It is difficult to just take the postscript literally and not to regard the metaphor for a man who was as brilliant, gifted, and accomplished as he was damaged, confined by his own demons and ultimately cut short in both life and letters. We offer this letter for sale HERE. As a wordsmith, Churchill was famous for weaving seemingly disparate threads of history and experience, sentiment and perspective to create a cogent and compelling vision. 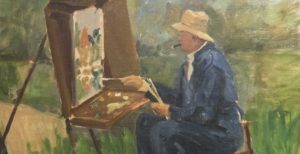 So perhaps it should not be surprising that Churchill was an accomplished and devoted amateur painter; for Churchill, compellingly sharing his perspective was literal as well as figurative, and recreation as well as vocation. Churchill first took up painting during the First World War. May 1915 saw Churchill scapegoated for failure in the Dardanelles and slaughter at Gallipoli and forced from his Cabinet position at the Admiralty. By November 1915 Churchill was serving at the Front, leading a battalion in the trenches. But during the summer of 1915, as he battled depression, he rented Hoe Farm in Surrey, which he frequented with his wife and three children. One day in June, Churchill noticed his brother’s wife, Gwendeline, sketching in watercolors. Churchill borrowed her brush and swiftly found solace in painting, which would be a passion and source of release and renewal for the remaining half century of his long life. This passion would bind Churchill to French-born painter Paul Maze, Churchill’s close friend, “companion of the brush” and artistic mentor, known as the “last of the Impressionists”. This blog post is prompted by our recent acquisition of a first edition set of Churchill’s Marlborough, inscribed by Churchill to Maze (discussed at the end of this post). Paul Lucien Maze (1887-1979) was regarded as one of the great artists of his generation and “learned the rudiments of painting from family friends that included Renoir, Monet, Dufy and Pissarro.” His work is held in the collections of many major galleries including The Tate Gallery, the Fitzwilliam Museum and the Glasgow Art Gallery and Museum. Churchill’s official Biographer, Martin Gilbert, called Maze “One of Churchill’s closest French friends.” (Gilbert, VI, p.856) This friendship transcended painting, as is evident from shared moments, perspective, and correspondence between them during Churchill’s 1930s “wilderness years”. Winston Churchill’s monumental biography of his great ancestor, John Churchill, the first Duke of Marlborough, took 10 years of research and writing and is Churchill’s most substantial published work of the 1930s. This decade saw Churchill pass into his sixties with his own future as uncertain as that of his nation. Churchill may have wondered more than once if the life history he was writing about a great ancestor might ultimately eclipse his own. Maze knew and regarded this Churchill – the statesman and wordsmith – just as well as Churchill the painter. As Churchill’s wilderness years and his friendship with Paul Maze remind us, painting was doubtless a vital stillness in the great and turbulent sweep of Churchill’s otherwise tremendously public life. 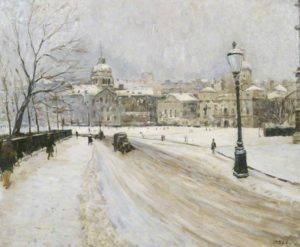 When he finally published a book on the subject in 1948, Churchill wrote of his and Maze’s shared passion: “Painting is a friend who makes no undue demands, excites to no exhausting pursuits, keeps faithful pace even with feeble steps, and holds her canvas as a screen between us and the envious eyes of Time or the surly advance of Decrepitude.” (Painting as a Pastime). Post-war, Maze’s friendship with Churchill continued, as did the twining of their respective paths. Churchill served as Queen Elizabeth II’s first Prime Minister, Maze as the Official Painter of her Coronation. Maze was a frequent Chartwell guest, he and Churchill painting together into Churchill’s final years, both in England and in Maze’s native France. The friendship was posthumously sealed by family alliance when, in 1979, Paul Maze’s grand-daughter, Jeanne Maze, married Winston Churchill’s first cousin once removed, Robert W.C. Spencer-Churchill. Two months after Volume I was published, on 12 December 1933, T.E. Lawrence wrote to Churchill: “I finished it only yesterday. I wish I had not… Marlborough has the big scene-painting, the informed pictures of men, the sober comment on political method, the humour, irony and understanding of your normal writing: but beyond that it shows more discipline and strength: and great dignity. It is history, solemn and decorative.” Given the role of painting in settling and steadying Churchill during the turbulent 1930s, it is fascinatingly apt and trenchant that a fellow wordsmith like Lawrence would use the “scene-painting” metaphor. 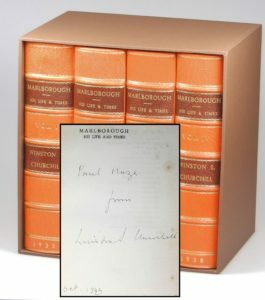 We are pleased to have just listed a full, four-volume set of British first edition, first printings of Churchill’s Marlborough: His Life and Times inscribed in the first volume in the month of publication to Paul Maze. 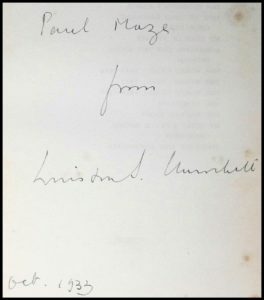 The four-line, inked inscription on the Volume I half-title reads: “Paul Maze | from | Winston S. Churchill | Oct. 1933”. The set is magnificently bound in full orange morocco (evocative of the Publisher’s original signed and limited issue of the first edition), featuring gilt-bordered, raised spine bands, brown morocco title and author labels, gilt front cover frame rules, beveled edge boards, head and foot bands, hand-marbled endpapers, and freshly gilt top edges, and tissue guard bound in preceding the inscription. The set is housed in a stout brown cloth slipcase with brown satin ribbon pull. A full description of the set may be found HERE.